This MicroMac Logic Board Trade-up upgrades 520-series, 550-series and 575-series Macintosh models, as well as the Mac TV, to a 603-based PowerPC Macintosh model identical to a 5200-series Mac. Performance is accelerated to a 75MHz or 90MHz PPC603 processor. Run SoftWindows, Games and the latest Multimedia Authoring Software! The MicroMac PowerPC 5200 from 5xx Logic Board Trade-up converts your 68040-based Macintosh to a PowerPC-based Macintosh. Now you have the ability to run PowerPC applications and the latest System software without sacrificing the current investment you've made in your Macintosh computer system. PowerPC Processor: The MicroMac Technology 5200 from 5xx logic board trade-up converts your existing 68040 or 68LC040-based Macintosh to a real PowerPC-based Mac. You now will be able to run applications that have been written especially for a PowerPC processor. These applications include, for example, SoftWindows to run Windows applications on your Mac, RealPlayer to download streaming audio and video from the Net, and Riven, a popular game. Take advantage of the added speed of Apple's System 8 and 8.1 with the PowerPC native Finder. Memory Capabilities: The 5200 from 5xx logic board has two 72-pin SIMM sockets. With this logic board you can have up to 64MB of RAM. You can easily transfer the SIMM from your slower logic board to the 5200 from 5xx logic board. You then can populate the second SIMM slot with a new SIMM or an existing 72-pin SIMM from an earlier upgrade. System and Tool Requirements: A Phillips screw driver and an optional antistatic grounding strap (available at most computer hardware stores). Upgrade Installation: Prior to installing the MicroMac 5200 from 5xx PowerPC Logic Board Trade-up you will need to update or reinstall the System OS 7.5.1 - 8.1 software so that it is compatible with the 5200 from 5xx logic board. This is a simple procedure that is outlined in the documentation that comes with the 5200 from 5xx PowerPC Logic Board Trade-up. 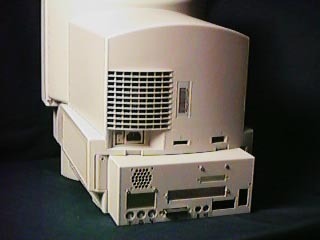 Once you have the correct System software installed, the installation involves removing the current 68040 logic board from your computer (which easily unplugs from the inner case), installing the new 5200 from 5xx logic board and finally attaching the case extention to the back of your 5xx series Macintosh. Follow the instructions in "Installing the P5200 logic board." Time Requirement: About one hour; 45 minutes are required for System Software installation, 15 minutes are required for the hardware exchange of the logic board and the installation of the case extension. MicroMac Delivers: MicroMac 603-based 5200 from 5xx PowerPC Logic Board Trade-up with documentation. More Questions: look into our FAQ page. * Price includes trade-in of your current logic board. A $200 deposit will be added to your order and refunded upon receipt of your old 68040 based logic board. A $100 deposit will be added to your order and refunded upon receipt of your old 68030-based logic board.